Jean Pierre Bemba, the richest man Equateur province in the Democratic Republic of Congo, still awaits his trial for war crimes and crimes against humanity at the International Criminal Court. His home province finally enjoys relative political and social stability, although 93 % of the population lives in extreme poverty despite significant diamond mines that houses and made rich Bemba. Decades of armed conflict, corruption, poor infrastructure and a meager investment in basic services and agriculture have plunged the population in a situation of hopelessness. However, against the odds, the Congolese displayed optimism and joy. 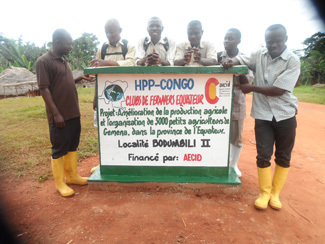 Humana, along with HPP-Congo and cofinancing of AECID, launched in November 2011, the Farmers' Club project in twelve villages within 25 kilometers of Gemena, capital of Equateur province. Since then, more than 3,000 farmers have participated in the project and about 18,000 have benefited indirectly from it. In addition to the establishment of committees, the project has promoted crop diversification and training on production, multiplication and seed selection. 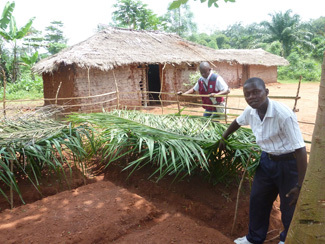 "I've learned farming techniques such as planting online, allowing me to easily remove weeds and quantify the number of seeds that I will need. In addition, the club has given me specific tools for cultivation. I am grateful for the project and hope to continue the good work even the next 20 years," says Marcel Fidsimonzego, a member of one of the committees. The Farmers' Club has also promoted literacy activities and improved nutrition and hygiene habits and facilitated the access of households to safe water. Ascain Lemowi, secretary of one of the clubs, said: "Thanks to the project, we were able to install a latrine toilets and drinking fountains. We also have a literacy center where we hope to develop more activities in the future." The project, which lasted two years and has recently been extended for six months, has achieved its goal: to improve the lives of the members of the club. Among his major accomplishments was the increase of agricultural production by 25 % and reducing related water intake in poor conditions.